This article is about the community in California. For the lake on the Colorado River, see Lake Havasu. For other uses, see Havasu (disambiguation). Lake Havasu with Lake Havasu City, Arizona on the east shore and Havasu Lake, California on the western shore. 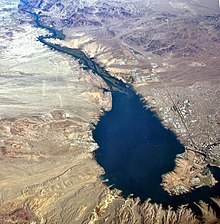 Havasu Lake is an unincorporated community in San Bernardino County, California, United States, located on Lake Havasu on the Chemehuevi Reservation in the Mojave Desert. The community serves as the seat of the tribal government of the Chemehuevi Indian Tribe and is home to the Havasu Landing Casino. The Siwavaats Junior College in Lake Havasu teaches children the Chemehuevi language. ^ Baird, Kevin. "Learning the language: The tribe is working to have more children learn Chemehuevi as few adults speak it fluently". Havasu News-Herald. Retrieved 2015-10-03. This page was last edited on 3 March 2019, at 23:29 (UTC).